Living their spirituality, exploring relevant issues and learning the history of the Christian faith are threads in teaching our youth. Service activities, retreats and camps also benefit our young people’s spiritual development. Contact our Programs Manager Nina Jonson. This year, we will be learning about ways to put our faith into action by examining societal issues that affect us all. Food insecurity, bullying, the environment, white privilege are among the topics we hope to cover. As a Progressive Christian church community committed to social justice, Plymouth wants to educate our young people on issues of the day, while giving them freedom to determine which issues are priorities for them. Young people have endless energy, passion and commitment to improve the world, so the class will help them channel their enthusiasm into action and equip them to be fully empowered young people, who can be current and future leaders at Plymouth. Our teaching team members are Tim Brunelle, Heidi McCallister, Mike McCallister and Carrie Sauter, assisted by Emily Moses-Thomsen. Questions? Contact Nina Jonson. Classes offer fellowship, student-initiated discussions on a variety of topics, service activities, retreats, outings and leadership opportunities. Class will meet Sunday mornings, 10:00–10:50, in the Senior High room (below the Chapel). On Wednesday evenings, too, socializing, snacks and community building activities will be available to offer more time together. Teaching team members are Nina Jonson, Sally Cassellius and Margi Youmans. 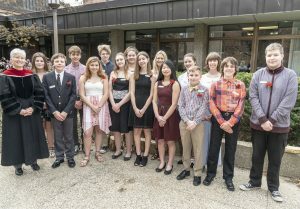 Plymouth Congregational Church offers a one-year Confirmation program beginning in September with students entering the eighth grade. A student entering this program is not signing on to be confirmed, but rather is signing on to the process. The decision of whether to join the church and participate in the Rite of Confirmation is made at the end of the process on the first Sunday in May. The goal of this program is to have the students explore their journeys of faith. Students are confirmed to wherever they are on their journey. This program requires parent participation and connects students to the church and church community. Students are expected to complete the following requirements in order to be confirmed as a member of Plymouth Congregational Church: regular class attendance and participation, a Statement of Faith paper and a Faith Reflection project. Students are assigned a mentor who has been vetted by the church and will join the student for class once a month. Parents are encouraged to attend a monthly parenting meeting held while the students are in class. Classes meet from 6 to 7 p.m. most Wednesdays from mid-September to the first Sunday in May. For questions, contact Seth Patterson.